Good morning! I loved this morning’s devotion. 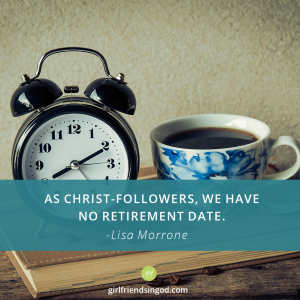 We have discussed this many times among our friends and just last week told our husbands that there is no retirement date when you serve the Lord. Thank you for your confirmation of this. I will continue to serve in whatever capacity I can (and there are many ways to do this) as I come off the Board in our church after serving for many years. 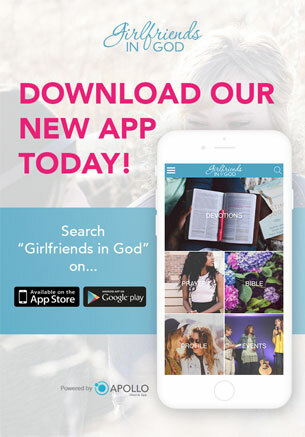 Bless you, girlfriends, and keep showing up in my mailbox each morning! Colleen–you go girl! Serve until Jesus calls you to His side! My 94 year old friend, Helen, is in a nursing home, confined to a wheelchair. Her hearing is failing and her sight is dim, yet the Lord uses her daily to be a comfort and an encouragement to those around her! I am moving into a new chapter in my life and I have been seeking where the Lord wants me to serve. At this point being in transition I am not able to commit to a task however the Lord has been giving me lots of opportunities to fill in where I can. There is so much work to be done that many take for granted. In the small churches that I attend even taking out the trash is a big help. Thank you for your encouragement today. Kathy, you are so right. Service for the King doesn’t need a title, nor does it need to garnish “public awareness”. He knows our heart, sees our faith in action–both in big and small efforts, and smiles ear to ear when our faith prompts us to do good works. Pls. don’t vilify the retirement ladies, just yet. Some of us are just leaving a long term job and need time to “re-charge”ourselves and feel a new calling. Thanks for the devotionals. They are like a “AA” battery everyday! Hey, I agree–we all need a time to rest, recharge and refocus to be effective in our service (Sabbaticals are a God-idea). This is especially true when changing churches or going through major life changes, such as you describe. Today I’ve written to encourage those who have been on the sidelines for years with no plan of re-entry. We are all needed on the playing field. This is HIS game, and we’ve each been drafted to fill a critical role. Very well said, Lisa! It truly spoke to my heart this morning as I start out this new week. Yesterday, as I took the Lord’s Supper at church, I apologized to God about the past week for being negative and complaining about my commute, traffic, and work. I still managed to ‘Do Good’ and to do the work He has anointed me with to the best of my abilities, but it was the attitude of my heart that required reflection and change. This grand new week, although I came into work with lots to do, projects needing attention, changes needing to take place, I will do my best to keep the attitude of my heart in check and will do His work with gladness and joy. It is difficult at times, but God isn’t going to bless us with anything greater if we can’t handle what is at hand. Therefore, I must manage His gifts well with a cheerful heart. Thank you for your message! Have a blessed day! 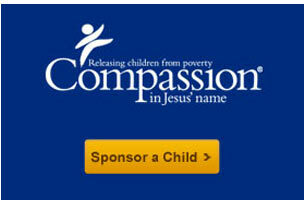 When my children were young I worked in many areas reaching and teaching children. Now they’re all grown and have moved out. I’ve been asking the Lord what He wants me to do but so far He hasn’t answered. So now I work in ministries for which I have experience, interest or see a need. But I’m still working for the Lord. Just because the ladies stopped working with the children doesn’t mean they’ve stopped working for the Lord entirely. It’s possible that, like me, they’ve moved on to other ministries. My mom retired 5 or 6 years ago and does more for her church than EVER before!!! And those older women were such a blessing to me, the director of the refreshment department! Being able to talk to them, glean some of their wisdom and stories and to be encouraged that no matter what age we are, God still uses us was such a lesson for me! And when one of those ladies, sweet Angela could no longer work in the kitchen, I knew she still wasn’t “retired” but instead was home “holding up our arms” with prayer (Exodus 17:12). 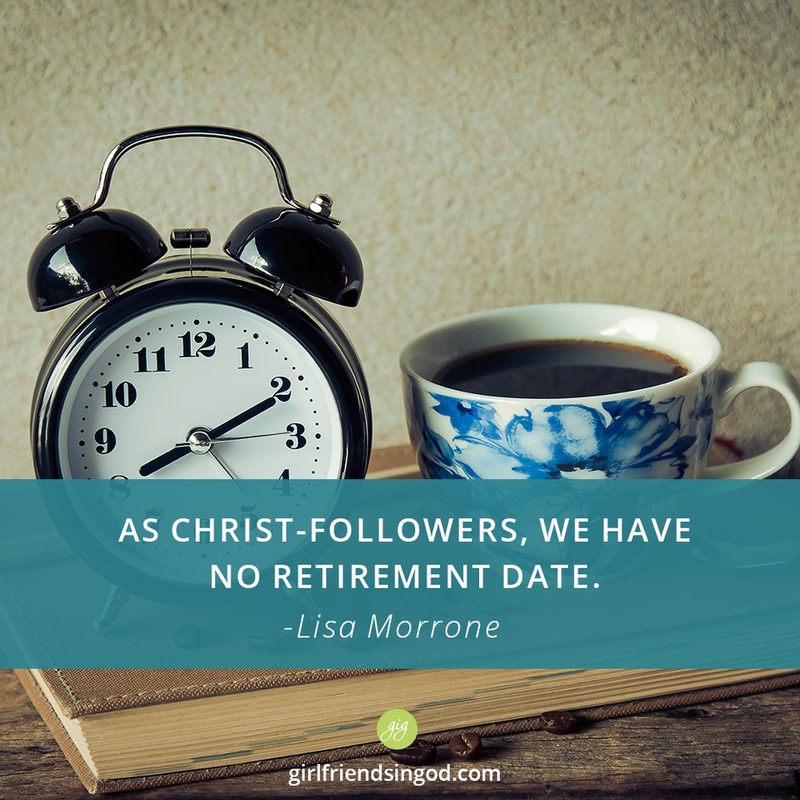 What a great word this devotion is Lisa! I have served in various ministries wthin my church. This fall, they were short of teachers and I was asked to co-teach the pre-k class. I’ll honestly admit I thought this job should be done by the young moms. But, there was a need and I agreed to do it, Another honest confession, I don’t know if I’m cut out to do this. But, God is faithful. He knows every thought and feeling I have. He also sees my heart of service. So I pray, every day. That God would lead and guide me and use me for His kingdom purpise. Thank you for reminding me that serving the Lird has no retirement daye!